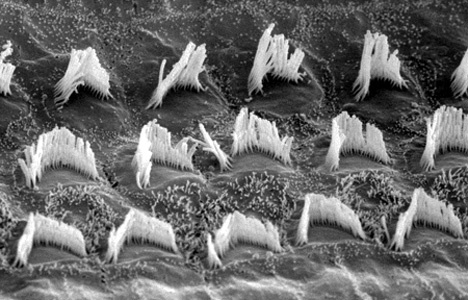 Being a mammal is pretty great in most respects – until you realize that we can’t regenerate damaged auditory hair cells like some other animals, that is. Once you’ve damaged your hearing, that damage is permanent. But maybe that won’t always be the case, because researchers from Massachusetts Eye and Ear and Harvard Medical School are working on a solution that allows damaged mammalian auditory hair cells to renew themselves, bringing on partial hearing recovery. Hearing can be damaged in a number of ways, including noise trauma, infections, certain drugs and natural aging. 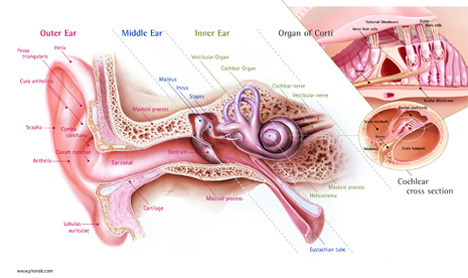 Hearing loss occurs when auditory hair cells, located in the cochlea of the inner ear, sustain damage. Hearing aids offer some help for people who have partial hearing loss, but they don’t actually fix what’s wrong. This new research could actually reverse the hearing loss, making hearing aids unnecessary. The key to the research lies in a certain drug that, when applied to stem cells from the ears of mice, was able to stimulate regeneration of auditory hair cells. After applying these new cells to the cochlea of deaf mice, researchers observed partial hearing recovery. The method hasn’t yet been tested in humans, but the researchers are hopeful that their discovery could lead to reversing deafness in people as well as mice. See more in Weird Science or under Science. January, 2013.